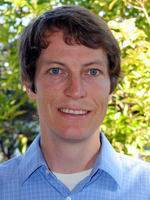 Prior to joining UNM, Daniel Feezell was a Project Scientist in the Solid-State Lighting and Energy Center at the University of California Santa Barbara (UCSB) from 2010-2012. Working in the research group of Prof. Shuji Nakamura, he directed projects on nonpolar and semipolar light-emitting diodes (LEDs) and laser diodes. A significant accomplishment during this period includes the first demonstration of a nonpolar GaN-based vertical-cavity surface-emitting laser. From 2008-2010, Dr. Feezell was a Senior Device Scientist and the first employee at Soraa, Inc., where he developed high-performance GaN-based laser diodes and LEDs. For his role in the achievement of the first nonpolar GaN-based edge-emitting laser diodes he received the 30th Annual Japanese Journal of Applied Physics Paper Award. In 2013 he received a Defense Advanced Research Projects Agency (DARPA) Young Faculty Award with a Director’s Fellowship Extension in 2015. He also received a National Science Foundation Faculty Early Career Development (CAREER) Award in 2015. He is the author or co-author of more than 70 peer-reviewed conference and journal publications, and has received several patents.